Devices are 100% compatible with the industry-standard Power-SO8 footprint; no other compact, surface-mount devices yet meet UL2595 which calls for minimum creepage and clearance distances of 1.5mm between Source and Drain terminals. Unlike some competing Power-SO8 types which are constructed using wire bonding, Nexperia’s LFPAK56 package uses a copper clip which is soldered in a single operation to the surface of the die. This reduces spreading resistance and gives LFPAK56 superior electrical and thermal characteristics as well as increased reliability. 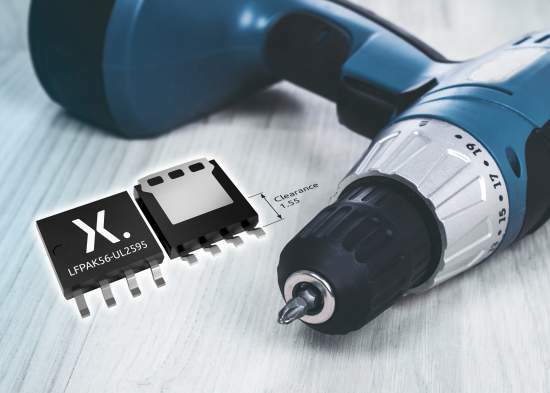 The new PSMN0R9-30ULD and PSMN1R0-40ULD N-channel MOSFETs in the enhanced SOT1023A package feature a creepage distance of 1.5mm and a clearance distance of 1.55mm. The PSMN0R9-30ULD device is rated at 30 V, offering 0.87 mΩ and 300 A, the PSMN1R0-40ULD is rated at 40 V, with 1.1 mΩ and 280 A. The PSMN0R9-30ULD and PSMN0R9-40ULD MOSFETs are part of Nexperia’s NextPowerS3 family of devices that offer a combination of low RDS(on), high maximum current and strong safe operating area (SOA), perfect for battery-powered motor control applications.